Eliminating Ice Dams on your Roof. Ice dams are those berms of frozen stuff that form along the eaves of a house during extended periods of cold weather, and this past winter was especially bad for ice dam formation all across Canada. When rooftop ice berms get large enough, they stop the free flow of rain water and melting snow off the roof. The resulting back-up of water then forms a small rooftop lake, above the dam, that seeps underneath any kind of shingles -- asphalt, cedar or concrete tiles. Wrestling with an on-going ice dam problem is frustrating and costly. The solution depends on an accurate understanding of the problem and successful implementation of one of three possible solutions. 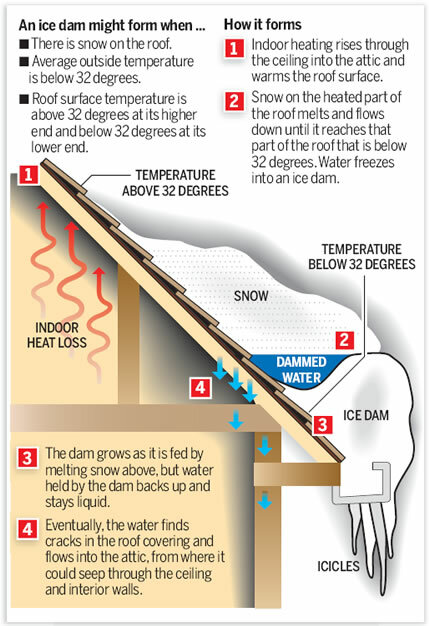 Ice Dams Signify Heat Loss Strange as it seems, an ice dam proves that too much heat is escaping through your roof, not too little, as you might think. Ice dams form when a too-warm roof surface causes snow to melt as it falls on the roof, even when the surrounding air temperature is slightly below freezing. Since the source of heat comes from inside the house, the eaves of the roof are invariably colder, since they don’t have a warm room underneath. When the warmed flow of melt-water hits the cold eaves it freezes and forms a small ice ridge. This ridge -- the seed of the ice dam -- continues to trap and freeze roof water on its journey downwards toward the ground. And as the dam builds, water is trapped above it on the warm part of the roof, where it’s free to seep underneath your shingles. Solution #1: Impervious Eaves One way to solve the ice dam problem is to fasten a continuous, waterproof layer of rubber, metal or asphalt roofing over the lowest 8 or 10 courses of shingles along the eaves. This waterproof layer must tuck underneath the uppermost course of shingles above it to shed water properly. This fix won’t stop the ice dam from forming, but it will stop standing melt water from seeping between courses of shingles. This solution is most suitable for use with asphalt shingles because it’s easiest to visually match a waterproof membrane with the surrounding roof. But even still, there’s no hiding this added waterproof layer. Aesthetic considerations are the biggest strike against this solution. Solution #2: Heated Eaves Every building supply outlet stocks high-resistance electrical heating cable made especially for melting eaves-based ice dams. This cable is designed to zig-zag along the eaves, up as far as ice typically develops during a severe winter. The cables are held in place with screwed-down clips over top of waterproof grommets. The cables tap into your home’s electrical system and can be switched on and off by thermostat or manually. Eaves-heating cables are easier to install than an eaves membrane, and they don’t look as obtrusive, especially against a cedar or tile roof. The downside is that roof-heating cables consume valuable, and increasingly expensive, electricity. Solution #3: The Cold Roof The ultimate solution to the ice dam problem is also the most difficult to achieve: keeping the roof’s surface uniformly cold. A combination of adding more attic insulation and increasing attic ventilation is often the basis of a good solution that will also reduce your heating costs and lengthen shingle life. Wind-powered whirligig vents do a great job increasing attic air movement, with minimal construction hassle. The installation of sheet metal roofing can also solve ice damming as a side benefit. The typical practice of installing horizontal wooden strips across an old roof before installing metal roofing sheets creates an added layer of insulating air between the roof’s upper surface and the heat inside your house. Although ice is probably the last thing on your mind right now, winter will be here soon enough. And if you had ice dam problems last year, don’t fool yourself into believing you’ll be safe this time. The only assurance comes from making the necessary changes to your roof and attic, and the cool days of autumn are an excellent time to do that. For more information, contact New Roof Long Island, a professional roofing company. We have over 30 years of roofing repair experience. We can fix any of your roofing issues. Contact New Roof Long Island Today!! We are partnered with the major roofing material companies and will beat any roofing contractor quotes. Get your price then call us for a free roofing estimate. We travel across Nassau County, Suffolk County and Queens New York installing new roofs and fixing old leaky roofs. Nassau County, New York - Roof Leaks, Roof Repair Service, New Roof Installation, We will fix your Roof. Click on your town in Nassau County for Emergency Roofing Service, A New Roof Installation, Roof Maintenance or More Information. Suffolk County, New York - Roof Leaks, Roof Repair Service, New Roof Installation, We will fix your Roof. Click on your town in Suffolk County for Emergency Roofing Service, A New Roof Installation, Roof Maintenance or More Information.